Free Shipping - Shop Now. How Firm Is a Firm Mattress? One word is probably used more than any other when it comes to our customers’ quest to find the best mattress in Atlanta – firm. But what exactly does it mean when you describe a mattress as firm? The dictionary defines “firm” as an adjective meaning “having a solid, almost unyielding surface or structure.” But when it comes to shopping for mattresses in Atlanta, what people mean when they say “firm” is much harder to define. One person might describe one of the natural organic mattresses featured in our showroom as firm, while someone else might not. In other words, the firmness of our natural organic mattresses is completely subjective. The firmness of a mattress relates to its comfort. 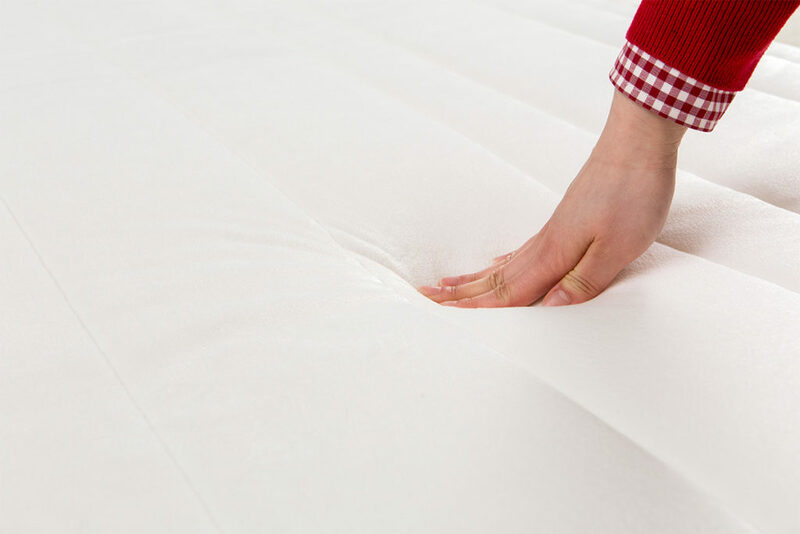 The support provided by a mattress is related to how well it promotes the proper alignment of your spine. A mattress can feel very soft yet provide exceptional support. The opposite is also true – a very firm mattress doesn’t necessarily provide good spinal alignment. Both comfort and support are extremely important when it comes to choosing the right mattress, so it’s important to understand what they mean. At Natural Sleep Mattress, we take the time to talk to you and to understand what is important to you when it comes to selecting the best mattress for you in Atlanta. Let’s look at the Legacy Series of natural Talalay latex and soy-based foam mattresses to demonstrate what we all of this means to you. To experience pure Talalay bliss is to experience conforming support, deep comfort and thermoneutral temperature regulation. These exceptional mattresses are made with soy-based upholstery-grade foams and layers of graphite-infused natural Talalay latex which are placed over layers of dense convoluted foam in an ascending support strategy. In addition to natural graphite-infused Talalay latex, high-density soy-based foams and other sustainable earth-friendly materials used to provide exceptional support, the Legacy Series of pure Talalay bliss mattresses at Natural Sleep Mattress in Atlanta also have features designed to enhance your comfort. For example, they are topped with quilted panels made with natural fabrics that take advantage of unique temperature control technology. The support provided by the Legacy Series of pure Talalay latex bliss mattresses is unwavering. The firmness, however, varies to accommodate the comfort preferences of individual shoppers. So, you can count on exceptional support, whether you enjoy sleeping on a Legacy Luxury Firm or Legacy Luxury Plush pure Talalay bliss from Natural Sleep Mattress in Atlanta. OrganicPedic’s Midori mattress, on the other hand, is a great option if you’re looking for a firm natural organic mattress. This contemporary, low-profile, two-sided mattress features a 6″ one-piece core of medium-firm 100%-natural rubber latex which is covered with the signature knit quilting found on all OrganicPedic mattresses. As the name implies, the EcoSanctuary Ultra Plush Mattress is ideal for those who like a softer mattress. This style of pure Talalay bliss combines an extra-plush latex layer that gently cradles your body with the exceptional support that natural latex mattresses from Talalay are known for. Beneath the cushiony comfort of the EcoSanctuary Ultra Plush Mattress is an all-natural Dunlop core made of USDA-certified organically grown latex that equalizes pressure and targets support right where it’s needed. If you’re not sure what level of firmness is right for you, visit Natural Sleep Mattress in Atlanta at 3129 Piedmont Road NE in Buckhead. Our showroom provides privacy, soft music and comfortable lighting so you can take your time determining which of our many products is the best mattress in Atlanta for you! Let Natural Sleep Mattress in Atlanta match you up with a mattress you’ll LOVE! Copyright © 2019. Natural Sleep Mattress & Organic Bedding.